I walked into a small independent camera store today to see about getting my Nikon fixed. Things are falling apart. The rubber lens ring flops around like a hulahoop. The focus is erratic, sometimes tack sharp, sometimes focusing four inches in front of what I’m aiming at. The camera even shuts off now and again. I’ve managed to atleast “fix” the last problem with a little piece of folded paper that I stick in the battery compartment to maintain constant pressure on the electrical contacts. It does not look good. Things are falling apart, succumbing to the natural entropy of the universe. This is of course only a small portion of things that we have just simply worn out. Early on in the trip I more or less destroyed a rear wheel. Only about 2500 miles in the trip, I wore a crack through my rear rim. Fortunately, the kind folks at Rivendell built a wheel the same day and overnighted it to the campsite. Over the course of our trip, our clothes have worn thin, some with holes, some with tears. My IceBreaker long sleeve wool shirt now has thumb holes at the cuffs, a new added “feature.” I had a well loved seersucker shirt that literally shredded at the tail after getting caught on my seat one too many times. We’ve had to buy new cycling shorts since a few pairs have only been a few threads away from the other side of decency. It takes humans 7 years to regenerate their bodies but apparently it only takes less than a year to completely wear out clothes and have to renew our wardrobe. 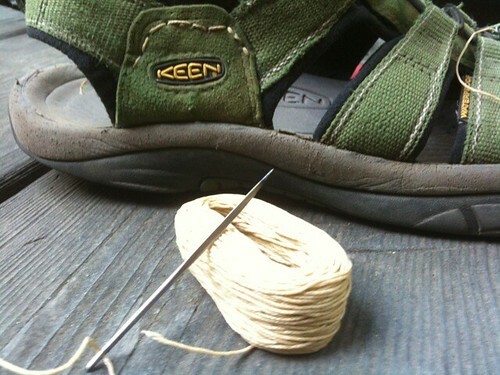 I’ve sewn my Keen sandals together with a Speedy Stitcher when it was starting to split at the ankles. I’ve also glued the foot bed down with Gorilla Glue. Once in Washington, I went to shift the front derailleur and the cable housing actually tore open in a dramatic puff of smoke. The housing had been so sun worn that it just split into several pieces. Speaking of derailleurs, I’ve broken a shifter and cracked another. We’ve snapped about 3 bike chains on climbs. We’ve gone through a few pairs of brake pads. Laura is on her 4th set of tires. Once, Laura was using her multi-tool to tighten a bolt and it cracked in her hand. Even the things meant to fix things are breaking. Our tent of a few years started to fail. The zippers stopped closing. There were tears in the mesh. Our sleeping pads have leaked air. I’m currently on my third type of sleeping pad having gone through a Big Agnes, an REI pad and now I’m keeping my fingers crossed the Therm-a-Rest will hold out. Laura keeps adding patches to her Big Agnes, reviving it from the dead with another healthy dab of glue and optimism. Don’t even ask about her pillow. Yes, we are REI members. I’ve chipped camp knives. We’ve worn out fire starters to their snapping point. All these unbreakable things crumbling in our hands. We’re not ham fisted about our belongings, they are just being put to use day after day. What is remarkable is that for all the bits of gears and equipment that are slowly failing around us, our bodies have remained fairly resistant. We are getting stronger, gaining endurance and perspective – if only our gear would do the same. Things are falling apart faster than we can replace them, but we do our best – repairing with glue and thread the things we can repair. It is a race against the natural order of things. When we are in towns, we hope that people don’t notice that the color of our shirts are fading a little and our shoes are dustier than most. This is the great irony of course, when vagabonding you spend a large amount of your time dirty and disheveled. You don the clothes of a pauper for the freedom of a king. And at times, you break down and buy some new clothes off the rack and it feels so luxurious to wear something no one else has worn before and you feel the like the richest person in the world and you forget about the other frayed ends conspiring to become undone. i love this line, it is perfect. I follow you both and read with joy where you are and what you are doing. may your bodies and spirits continue to hold up better than your gear! I might be the only woman who carries that same firestarter in her PURSE. You know, in case the infrastructure collapses while I’m out one day, and I have to stay warm. And now I know that it can break? Oh the humanity! I love reading your blog, and like Shannon Day said, what a great line about the freedom of a king – you are both so inspiring! Contrary to popular belief, freedom isn’t cheap. I would have to say though, that the freedom you two have chosen carries the best cost benefit analysis I can think of. And when you factor in a constant dose of serendipity that you have been encountering during your vagabonding, the return gets even better. I hope some day to follow in your pedaled path. Wow I can’t beleive you 2 have snaped 3 chains. The everthing else wearing is normal. You might try start using the ol’ trusty bic to start your stove. Yea being on the road everything starts to wear down to where one day everyone starts looking at you and the duck tape on the Panniers, raggy clothes, and just asume your a poor homeless person. That’s when it’s time to stop for a month and buy some new gear. Well keep on riding at least you are giving some good gear reviews. It’s amazing to read the blog and think of the treasures you’ve seen this last year. 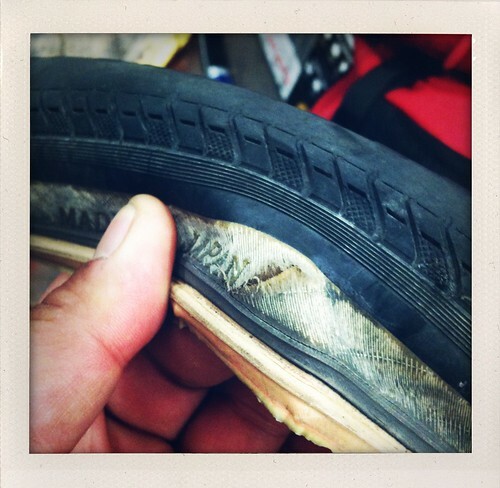 Wear and tear on equipment shows the miles you’ve crossed. Hang tough. i feel for you. i just spend 5 days repairing and buying new stuff. when i arrived at the guesthouse i didn’t even bother to take off my shirt and just ripped it off. seems that one year is the limit for a lot of stuff which til then was working quietly in the background. i was especially happy to find a shop which repaired my bags i couldn’t stitch myself. i’m glad you’re thinking about continuing your travels abroad. i’m in thailand right now and enjoy south east asia quite a lot. hopefully i make it to south america afterwards. all the best! This is the best post you’ve ever written. What is your criteria for replacement? Its nota sin to buy things you use everyday! I fix outdoor gear and footwear for a living and we have seen plenty of Keen’s come into our shop with the same problems you’ve described above. Glad to see that you are willing to use your own hands to get things working again. Although I still use one sometimes, I have mixed feelings about inflatable mattresses. I once spent several hours going between a very cold lake and my stove to try and patch my therma-rest while in NZ and still couldn’t find the last leak. You might consider a Z-rest or Ridgerest? I know they are bulky- but they don’t have air in them to leak! On the tent zipper- if the teeth are in good shape, you likely only need to replace the zipper sliders and wash the tent with Nikwax Tech Wash (making sure to do some scrubbing to the zipper teeth to get the dust out) and that would make it work again for quite a while. 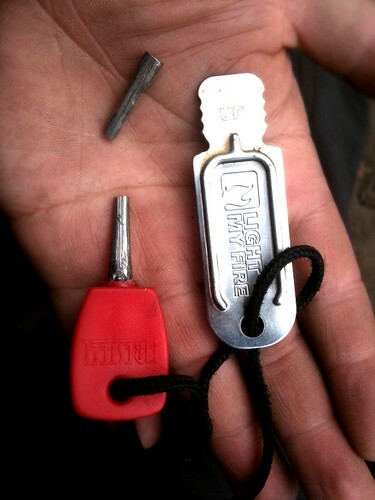 Dust and dirt are the enemy of zipper on outdoor gear. It was good chatting with you both outside of Greensboro on 8/28/10. Sorry I could not ride and chat with you a little more but that was my turnaround point for the day. It ended up being 93 miles as it was by the time I got home, and it did turn out to be quite warm. If your tent is getting past the point of no return I’ll be happy to help sponsor you. Although not cycling specific, I think you might also find some clothing in addition to our tents from The North Face that would help you on your adventure. Take a look at the website or look in the REI out in the Triangle for style numbers of stuff that you think would be of help. If you still have the business card I gave you can call me anytime over the holiday weekend to discuss further. Keep on keeping on! Interesting that you broke 2 shifters. I’m curious, did the shifters break b/c the bike fell over and landed on the shifter? I’m curious b/c the bar end shifters are the recommended touring shifter, but I would think they could be prone to getting beat up when the bike (inevitably) falls over. Thanks–I enjoy following your adventure. I know how you feel! For whatever reason, when Merino wool clothing reaches the end of its “life”, it deteriorates pretty spectacularly. My Smart Wool base-layer is like a wet tissue, I can’t put it on too quickly or I’m afraid it will tear in half. My condolences on the spontaneous de-generation of your gear. Nice article, I can relate!